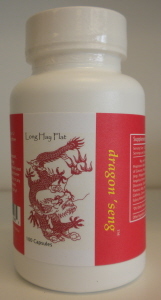 Dragon 'Seng is a natural Chinese herbal supplement for energy and stamina. It is one of the most popular herbal supplements that we carry. Dragon 'seng Chinese red ginseng and several other Chinese tonic herbs that balance and activate the overall formula. Dragon 'Seng boosts energy, promotes alertness, and improves overall feeling of well-being. It gives the pure energy and tonification that ginseng is known for, but in a smoother, more even-flowing, and long-lasting form. Dragon 'Seng is well-balanced so the long-term effects help increase the performance potential derived from inner strength gained by the organs, muscles, and nerves. Those who use Dragon 'Seng find they can go the extra distance during intense workouts or competitions. However, it doesn't leave you feeling depleted or run-down by any after-effects. The herbs in Dragon 'Seng nourish the basic activating qualities that give drive and movement to life. They also help to strengthen a person's will, breaking through the emotional restrictions from lack of assertiveness, or fear. It is the perfect daily energy supplement. Use 1-3 capsules per day or as needed. Contains: Ginseng, Polygonatum (Huang Jing), Polygonum Multiflorum, Angelica Sinensis, Schizandra, Dioscoriae, Glycyrrhizae, Lycii, Paeonia alba, Poria, Eucommia, Glehnia, Cornus, Citrus, Moutan, Salvia Miltorrhiza, Buplureum. This is great for just giving you the energy you need to get through your day! I feel like I am able to accomplish more and just feel more motivated with this! Like this products smoothness much more than traditional ginseng, don't feel as edgy or hyper with it, just feel great all day with one capsule!